My husband is getting into a bad habit nowadays. The one who scowled at eating snacks of any kind (except the super healthy types), he has started “demanding” for evening snacks when he gets home from work. And not any snacks – he needs the “fresh from the oven”, “fried yet low calorie”, “interesting stuff” etc etc. You get the drift, don’t you? I dunno whats with him all of a sudden. What intrigues me and leaves me flabbergasted is his request for “low calorie”, “low fat” version of totally fried goodies and he demands that I make sure they dont taste like they are tinkered with! I am like what’s with you! He is blaming the weather, his hectic work and god knows what else! Anyways, as the “chef” in my house, I am left with a fix. 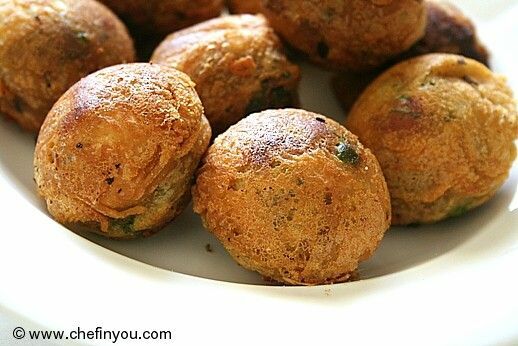 One of his recent demands was Bonda – all fried and crisp on the outside and soft inside – but low fat! 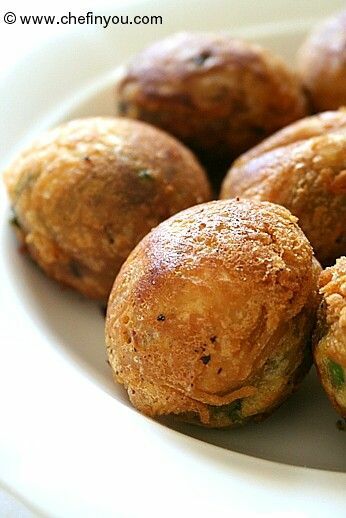 Bonda is a fried Potato fritter very famous in Indian cuisine. Its enjoyed as a snack more often where potatoes are boiled, mashed and cooked with onions and spices, coated with a batter made with besan (Indian chickpea flour) + rice flour and deep fried. With this as the base, the number of spices and additional ingredients vary from region to region. In the North its known as Batata Vada , which I already posted like ages ago. This is a South Indian version of the same. Its immensely simple and works great as an appetizer/snack. Codfish fritters - video recipe !